The Trump administration's rumored plans to withdraw U.S. military forces from Afghanistan have sparked fears of a new 9/11 terror attack on America as ISIS militants and Iranian forces march across the region in celebration of the Trump administration's decision to pull American forces from the region, according to top congressional leaders. Following the announcement that the United States will pull out of Syria, it appears the Trump administration is poised to do the same in Afghanistan, stoking fears among senior military leaders and Republican leaders in Congress who warn that ISIS forces and Iranian militants are poised to takeover Afghanistan and the wider region. Lawmakers who sit on Congress's Armed Services Committees are beginning to express their displeasure with the Trump administration's decision to abandon the region, telling the Washington Free Beacon the White House could be responsible for another 9/11-scale attack. In a press statement Rep. Jim Banks (R., Ind.) said threats will continue to rise if the United States pulls out of Afghanistan. "I hope these reports are simply not true," Banks said. "Our ongoing efforts in Afghanistan are necessary to ensure another 9/11 does not occur. With threats rising from ISIS-K and other terrorist groups, America's presence in Afghanistan today is as important as it has ever been to protect the homeland and our allies." Banks, an Afghanistan veteran who sits on the House Armed Services Committee, spoke to the Free Beacon on Friday about the pitfalls of the administration's new policy in a wide-ranging interview. "Inevitably, our drawdown or pullout from Afghanistan creates the conditions by which ISIS-K"—the terror group's Afghan arm—"takes over Afghanistan, and at that point [the country is] in worse shape we've seen it since 9/11," he said. Banks expressed great concern that Trump is bucking his top military leaders, all of whom have objected in past months to a withdrawal from Syria and Afghanistan. Defense Secretary Jim Mattis, in a scathing letter to President Trump, resigned his post in protest of these moves. "Whose voice is in the president's ear?" Banks wondered. "It's clear that all of these top military leaders that he's surrounded himself with" are advocating against a U.S. withdrawal. "He's got the right people around him, but clearly none of these leaders would be advising him in the direction he's taking. Whose voice is in his ear? That's a scary question to ask, but so far it's unclear who that is." Banks, who led a bipartisan delegation of lawmakers to Afghanistan just over a month ago, said he was "struck by the evolving threat in Afghanistan today." The threat of ISIS-K is "getting too little attention is Washington, but has much of our military leadership's attention in theater," Banks said. "What we saw and learned on the ground is that while ISIS has been pushed out of Iraq and Syria, they have built a pretty strong faction in Kabul. That part of it left me deeply concerned a month ago, but even more concerned by this news today" that the administration is angling to leave Afghanistan. Banks and others who spoke to the Free Beacon both on and off the record about the administration's plans categorically rejected the White House's claim that ISIS has been defeated. "It's simply not true," Banks said. 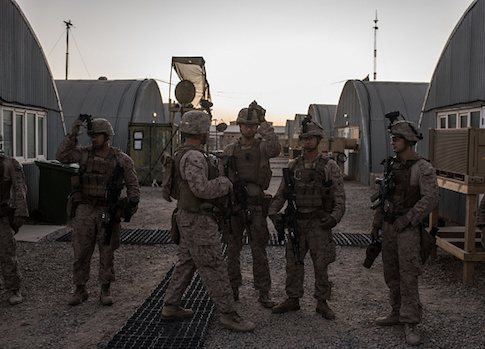 "With the rise of ISIS-K in Afghanistan, declaring victory would certainly be premature." There can be no question that Russian President Vladimir "Putin, the Iranians, certainly the Assad regime [in Syria] are celebrating the administration's decision," Banks said. "That leaves me more concerned than anything I've seen in recent months with this administration." Regional reports indicate that an Iranian "military column" consisting of "about 80 military vehicles with about 400 elements" has begun to march across the region in response to the Trump administration's plans to withdraw forces, according to Hawar news agency. "Syrian regime forces and the Iranians are gathering their troops in the western side of the Euphrates River at Deir ez-Zor governorate," the outlet reported. Republican leaders in Congress are now examining ways to reject and thwart the administration's decision, according to sources who spoke to the Free Beacon. "Congress has many tools to push and empower the president to counter Iran, not just in Syria but in battlefields across the Middle East," said one senior GOP congressional staffer, echoing the concerns of many who spoke to the Free Beacon about the matter. "So far there's been reluctance to pursue serious financial pressure, let alone AUMFs [authorizations for use of military force]," the source said. "This incident should be a wakeup call to lawmakers. Outraged tweets aren't going to cut it any more." Banks, for his part, is urging the Trump administration to learn from history as it pertains to the Middle East. He and other leaders on the Armed Services Committees are planning to immediately hold joint hearings on the matter. Trump's top military officials would likely be called to appear before such a committee and explain the administration's decision. "We have to go back and remember why we're in Afghanistan to begin with and that's to prevent attacks on the homeland," Banks said. "We've been very successful at that in Afghanistan and now the rise of ISIS-K at this moment at the same time as we're pulling out creates the conditions where more than ever before we're creating a recipe for disaster in Afghanistan that could have a really horrible impact down the road when it comes to attacks on the homeland." This entry was posted in National Security and tagged Afghanistan, Military. Bookmark the permalink.